Voting is open! Check out the 2012 nominees! The nominations are up and voting is now open in the 2012 Edublog Awards! Voting is open until 11:59 PM US Eastern Standard Time on Sunday, December the 9th! The winners will be announced at the Edublog Awards ceremony on the 12th at 7pm EST (more to come soon). Use the links in the sidebar to see all of the finalists – those moved through to the voting round. You can see all of the nominees in this google doc here. Check the tabs at the bottom of the google doc to see all of the different categories. This will also show you how we ended up ranking all of the nominees. Each year there are more and more nominations, and of increasing excellent quality, reflecting the ever growing edublogosphere — nice work guys! Unfortunately we can’t list every single nomination in each category — that’s too overwhelming for everyone. Instead, our intrepid team of judges combed through hundreds of nominated sites to whittle them down to a manageable number of shortlisted finalists for each category. Apologies in advance if your site or nominated sites don’t make it – this was such a tough decision! There are many factors that determine whether a nomination is shortlisted, and some categories were considerably more competitive than others due to the incredible number of nominations. Due to the thousands of nominations received, there is most likely a typo or mistake or two. Let us know in the comments so we can fix it up! 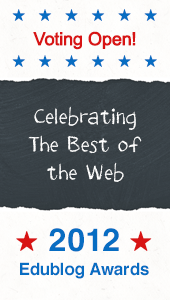 If you’ve been nominated, grab your badge from the top of your category page and it place in your sidebar linking back to the poll, nominations will be listed on those pages forevermore so wear ‘em with pride. Just go to the Vote Here link in the top navigation, choose the category you want to vote in, and then who you want to vote for! Easy! And best of all, once you have voteed, it loads a page where you can share your vote on Twitter or Facebook! Remember that only one vote per day per category will be counted from the same location! Thanks Tony! Definitely lots of bean counting. As far as I’m concerned everyone who is nominated or any one who works hard to support others online is a winner. Thank you for your hard work on the Edublogs! Clarification question: Is the badge icon only for those who made the finalist/shortlist, or for anyone who was nominated? Sites had to be nominated last week by someone else to be listed here. Thanks! but looking at the list, you just made the people with the most votes finalists, and then took the rest of the people with the most followers. The line this time was drawn based on number of nominations (weighted the most) and then number listed. It seemed like the most fair and valuable way. Thanks for letting us know, Sylvia. All fixed and sorry about that!